Is a career about ‘what I do’ or ‘who I am’? The true meaning of life lies in trying to make sense of this all pervasive question. Moreover, while most careers are seen as a means to an end, the most fulfilling careers are an end in themselves. They become you. If you’ve ever met a superbly passionate and dedicated doctor, teacher, photographer, financial analyst, golfer or even a dog trainer, you’ll know what I mean. Career decisions are life decisions. Fortunately, today, more than ever before, students can choose to think beyond the fields of Medicine and Engineering; they can become explorers, deep-sea divers, designers, artists, nutritionists, media experts, sports managers – anything is possible. You will not be scorned if you said you wanted to explore transgender studies or metaphysics or oenology or if you wanted to combine the study of economics with philosophy or baking with science & technology or genetics with computer science. Now it may be difficult to see these combinations in our home turf, but universities and colleges overseas are teeming with interesting student options that celebrate our multifarious personalities. In my opinion, studying overseas is an innovative way to explore the world. Allowing yourself to step out of your comfort zone and learn is a sure shot recipe for unique life experiences that can add value to your personality. Moreover, a variety of options and a holistic application-admission criterion against the backdrop of the rigid Indian university framework, make education overseas an attractive proposition today. Most international application wallets are a compilation of your academic scores in school and college, competitive scores in the SAT or ACT, SAT Subject Tests for undergrads or the GMAT or GRE exams for post graduation. Scores like the BMAT (Biomedical Aptitude Test) and the UKCAT (UK Clinical Aptitude Test) are essential for Medicine aspirants. Indian students also need to appear for an English proficiency test TOEFL or IELTS and submit recommendation letters from teachers or employers. However, the true differentiator in any application is the personal statement or the essay that colleges demand from students. This is where students have an opportunity to share who they really are. Time and again, university representatives have shared how disappointing it is reading an application that is high on numbers but is creatively ‘flat’. You can be a nerd, a drop-out, a wannabe pop-star, a space enthusiast, an editor, or a sports junkie… whoever you may be, it is important that your application reflects who you really are and not just what you have achieved. This is because top international universities are not merely concerned with the marks you score but are willing to look at the life you’ve lived and the experiences you have accumulated – and the only place where you get a chance to put yourself out there is in the college essays section. You might say: ‘So what’s the big deal? We can write essays. We’ve been writing essays since third grade’. Well, perhaps that is where the problem lies. We are taught the intro-body-conclusion format and told how to write. We are corrected, imposed upon, spell-checked, grilled on grammar and we even learn to write ‘model answers’ to the most asked essay topics! Then, in the journey of our lives, we chance upon an Ivy League application and a question that asks us: If you could put a message in a bottle, what would it say? Oops! Did I hear you say that this was not in the curriculum? Does it matter now, how well you can write? Or, how well can you think? International applications and admissions are a test of your thinking skills. It’s about changing the question from ‘how good am I’ to ‘how good can I be’. It’s about challenging yourself to change the benchmark from the peers in your neighbourhood to your co-learners and you across the world. How much money should I set aside for overseas education? Contrary to popular understanding, education abroad need not be expensive. While a number of universities offer liberal scholarships and financial aid to students based on need or merit, or both, there are colleges in the United States that are need-blind and will offer generous grants to students who are accepted. A recent case in point is my student from Jaipur, who was accepted for engineering at Drexel University, Pennsylvania, with a 100 per cent scholarship amounting to close to Rs 1.6 crores! There are the Erasmus Mundus and Commonwealth scholarships that are popular in the European Union and have made studying in Europe cheaper than studying in India. Many students choose Singapore as an affordable study option since they can apply for tuition grants with the Singaporean Ministry of Education. So, depending on your budget and your aspiration, there is a university and a scholarship that can be an ideal fit. Every step counts. Parents or counsellors and students must start working on a plan as early as in Class Nine. Planning in advance will give you a distinct advantage academically, financially and geographically. The plan must be a comprehensive outline that matches your dreams to your preparation – they are two sides of the same coin. Do your research and consult an unbiased counsellor to help you make sense of the plethora of options out there. For young minds aiming at higher education, particularly in India, the need of the decade is equitable, fair-minded direction so that they can plan better and achieve nothing less than the best. Unfortunately, commercial messages and miscommunication with vested interests are rampant today and even in this information age, they tend to confuse the student more than clarify. As a parent or a counsellor, when you help your child target a country, a university, a course, a scholarship in an organised manner you create a psychologically aspirational goal in the mind of the student. Often this orientation is enough to propel the student in the right direction and make them successful. However, I must warn you against making this as an obsessive-compulsive aspiration, for then it can become more of a constraint and limit. As David McCollough said: “Climb a mountain not so the world can see you but so you can see the world”. Careers define us. Get ready to write your own definition. Whatever the essay, remember: They are not asking you to change the world or be the next Steve Jobs; but they are certainly interested to know if you believe in your own brand. Seek guidance. It is a process of mentorship that can really add value. Watch the College Essay Impact presentation to know more. Imagine you are on a see-saw. Now imagine you are on a see-saw with your four-year old. Would you just put all your weight on one side and let the little fellow hang in the air on the other side? Hopefully not! Instead, you would perhaps drop your weight and release it so as to give him a sense of going up and down on the balance. You would let him enjoy the light-heartedness of being in the air, and you would let him enjoy the feeling that he was being able to exert his own weight too! Smilingly surrendering. Most parenting is similar to this see-saw experience. You are in-charge, yet you must be willing to let go. You have the experience to be able to predict the outcome of a certain action, but you allow mistakes to be made, so that lessons can be drawn and your child too becomes experienced. You enjoy their flight, but are also ready with a safety net (just in case). You pretend to lose an argument, a decision, or a game only to be able to revel in the joy of seeing your child win. You might have the resources to give her everything, but you need the wisdom to stop at something. And anytime you do feel the temptation to give your child ‘everything’ – remember the see-saw – remember that you are creating a situation for him/her to be in the air – but for how long ?! Are you a Working Parent? I have been working all my life and logically so, when I become a parent, everyone around me said that now I am a ‘working – parent’. But very early into parenthood, I realised that the phrase was a lie! It was a put together in the reverse! As soon as I decided to bring a new life into this world, I became a parent (who also happened to be working) – so actually I was now a ‘parent – working’ and not a working – parent. Within the same thought process, I figured that from hereon my primary identity would be that of a parent first. Ever since, without any regrets, I have been a parent – shopping, parent – napping, parent – teaching, parent – fighting, parent – banking, parent – driving, parent – sleeping, parent – negotiating, parent – cooking, parent – organizing, parent – travelling, parent – this … and parent – that! Come to think of it, parenting is the single most important role that determines the quality of our future citizens, how can we make it a part-time job! And considering that it is indeed a full-time occupation, wonder how come our mere ability to procreate, makes us eligible for the job! Radhika Vaz’s article, Rotten Apples says it well – “I think that prospective parents should be subject to a written exam followed with an interview to assess their abilities to raise a responsible next generation…” Till such time, ask yourself if you are still a working – parent? Bengaluru, 28th June 2014: The hall was packed with people finding space on the aisles of the Sathya Sai auditorium – a hall that can seat close to 600! One could have mistaken it for the premier of a new Rajnikant flick; but it was the attendance for the book launch of Million Dollar Solopreneur, a path-breaking book born out of a life-changing idea by Serial Solopreneur, Sandeep Gupta. This has turned out to be my fastest book project ever! 26th April 2014, when I stepped out of Sandeep’s Delhi office, I never really thought to myself that two months from then, we will be sharing a stage opportunity to launch his first book, and that too in the city of Bengaluru! The story of how it took shape is in the book. For all those itching to write, it’s been super inspiring to see Sandeep work round-the-clock, churning out the book in less than two weeks! Yes, that’s right 80,000 words (brought down to 50,000) in less than a fortnight! For most of us, it would take even longer to decide on a job, a course, an idea, anything! Well, given his clarity of thought and single-minded determination to launch on the 28th of June, his birthday and also the day he wanted to unravel the secret to becoming a Million Dollar Solopreneur – simply meant that I had to work extra-hard to edit, make the book publishing ready & create book proposals to find a suitable publishing partner (who would be willing to publish and ship the books to Bangalore within the time frame)! Well, where there’s a will, the way just shows up! Fifteen days to the launch, and we found a committed, go-getter partner in Rajan Arya of Pentagon Press, who ensured that close to a thousand hard-bound, premium quality books were at the venue two days prior to launch! As a professional speaker on both Indian and global stages, “Sandeep loves to propagate absolutely novel ideas with passion, rebellion, and wit,” shared Abhijit Bhaduri. Apart from his, Top-One-Percent GMAT Training that has helped thousands of students join Ivy-League Business Schools across the world. Harvard, Stanford, Wharton, Booth, Kellogg, MIT, LBS, and INSEAD, Sandeep is also the resident Ace Mentor at The Professional Speakers Academy London. Over the years, I have worked on many books, but every once in a while a big idea comes along and we only hope and pray that it positively impacts more and more people around us. Million Dollar Solopreneur is a big idea. As an editor, it has been a reflective project not just deep-diving into the WHY and WHAT of the concept, but more importantly, the HOW of Solopreneurship. My best moment from the launch was when Sandeep quipped, “Million Dollar Solopreneur is essentially for the professional who wants to fire his boss; someone who wants to have time for himself; someone who wants to make more money and impact people! Does that mean, you?” Everyone nodded. Bosses beware. You can make a resume – it’s only facts in an order… Does this guarantee your place at an Ivy League? Do the Admission guards at Princeton, Brown, Harvard pop-up their heads in delight and say, ‘Come, come dear ones, we were just waiting for you’ ? Perhaps Not. Time and again, university representatives have shared how disappointing it is reading an application that reads high on numbers but is creatively ‘flat’. You can be a nerd, a drop-out, a wannabe pop-star, a space enthusiast, an editor, a sports junkie…who ever you are, it is important that your application reflects who you are and not just what you have achieved. The important question is: Do you believe in your own brand? – Oops! Did I hear you say that this was not in the curriculum! Does it matter now, how well you can write? OR How well can you think? No. No. No. Don’t just start drafting the answer as yet. Read it again and get into pre-writing mode (don’t know what that is? I will try and cover that in my next blog). What is important is to structure your thoughts and able to present the best and most honest representation of yourself. So the fight is not between the dragons and the elephants, it’s the inner giant that needs to be awakened! Some people are born as enlightened beings, they say. Really? How come? Can’t be – is the response of someone rational, someone who believes in a higher consciousness perhaps, but is unable to accept it as being present in a human being. I was guilty of the same skepticism, until this afternoon. I was invited to conduct a book launch ceremony. I was thrilled for many reasons. For one, the publisher, Wisdom Village, is like family, two, the book was on Lal Bahadur Shastri, an exponent of dignity and honour in Indian polity and the authors were none other than the legend’s son, Anil Shastri and my teacher & mentor for many years, Pavan Choudary. Ordinarily, this would have been just another book launch. 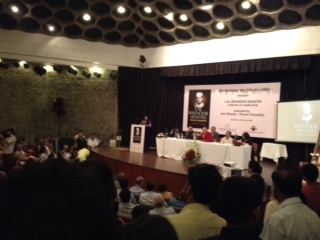 But when His Holiness the Dalai Lama consented to launch the book, the scale of the event changed dramatically. As the master of ceremonies, I had been reading and collating my notes on the authors, the publisher, the book and His Holiness. Thanks to the information age, a lot was available online, it was like a divinity broadcast complete with an itinerary, a history and profile. I compiled my script and knew that the right protocols were imperative. But is it only about protocols and procedure? The event started with the timely arrival of His Holiness and lighting of the lamp. My script was sharp, the speakers were thorough and the short film played without buffering. The photographer went click-click and I was keeping a tab on the tick-tock. As per schedule, His Holiness was invited to address the gathering that was so much more than the capacity of the hall. I was expecting a discourse; I’m sure some were expecting a somber sermon. But what’s this – everyone was laughing! The enlightened one in orange robes seemed to love humour! He was sharing how Shastriji’s mind was so much bigger than his lean body! He himself laughed with effervescent vivacity. I watched in awe and wondered at the light-hearted and free flowing persona of this majestic being. Exemplifying and embodying peace leading to progress, one could see that His Holiness the Dalai Lama was more present to people than to protocol and procedure. One could not seem to get enough of this witty Buddha. The youthful spirit of this 78 year old was shining across the hall. And as the event came to a closure, he got up to bless the people on the dias, in true Tibetan tradition – offering a white scarf (kata) around their neck. I stood at the podium witnessing the beautiful gesture; only to find him walking towards me with a kata. Without missing a moment, I moved forward, touched his feet and he placed the scarf around my neck. The silky white touched my hair, my arms and something deeper. There was stillness in that moment. There was contentment. There was an overwhelming wave of internal emotion and eternal gratitude that suddenly took over. I opened my eyes. He was heading towards the exit and I quickly resumed my position at the podium asking everyone to rise as His Holiness the Dalai Lama exits the hall. But did He?